This cute 6 month old leggy & brindle Beagle mix puppy with helicopter ears came to Wantagh, NY from Bowling Green, KY. He lost his eye at 10 weeks old when attacked by a larger dog. Otherwise he’s FINE. 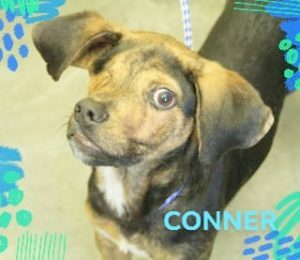 We will be looking for someone to protect & cherish CONNER for the rest of his life. Might that someone be YOU? This entry was posted in 6 to 12 Months, Adopted, Adopted Dogs, Dog Center, Dogs, Male, Special Needs, Wantagh Adoption Center. Bookmark the permalink.